Went over to the mister's house for dinner one night and his mum was cooking up a feast of Japanese dishes - sashimi, sushi, beef tataki and soba noodles, just to name a few. What really captured my attention, though, was her Agedashi Tofu - puffy, crisp and golden outside, with a soft, pillowy centre. I just had to ask her for the recipe, and discovered that it wasn't so hard after all to make - just needed a quick visit to my local Asian grocery for supplies. To make the sauce; bring the water, soy sauce and mirin to the boil. Add the dashi powder and stir to dissolve. Carefully taste to see if it is to your liking - adjust accordingly with either more soy sauce, mirin, water or dashi powder. Turn off the heat and set aside to cool. Peel the ginger, then finely grate and set aside. 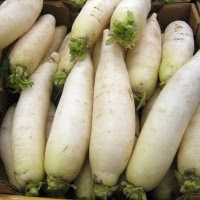 Peel the white radish, then finely grate and squeeze it dry with the palm of your hands. Set aside in a sieve to drain out excess juices. Wash the tofu, then pat dry with a paper towel. Place in a colander for at least 30 minutes to drain out excess water. Cut into 8 even pieces. Dip each piece of tofu into the potato starch to coat all sides. Set aside. Heat the oil to 180°C. To test if it is ready for deep-frying, insert a wooden chopstick (or handle of a wooden spoon) into the oil and if bubbles steadily move towards it, then the temperature is correct. If the bubbles move extremely vigorously, then the oil is too hot and needs to cool down a touch (you can do this by adding in a bit more oil). If no or very few bubbles pop up, then the oil is not ready yet! Carefully place a few tofu pieces into the hot oil, frying them in batches. Make sure you do not overcrowd the pot - the tofu will stick together and the dramatic temperature drop will result in oily, soggy tofu. As you can see, I used less oil which only came halfway up the tofu - I simply used wooden chopsticks to flip the tofu over and brown the opposite side. Transfer the cooked tofu onto absorbent paper towel to drain off excess oil. To serve, place the tofu in a serving bowl and garnish with grated radish, ginger and bonito flakes. Pour the sauce around the tofu, watch the bonito flakes dance and serve immediately!